The new year is upon us. Hello, 2015! How did 2014 work out for you guys? I hope it treated you well, but I hope that this year is even better than the last. You know how we can make sure 2015 starts out in a wonderfully kickass way? We can make this sandwich and devour it all without apology. Warm and crispy charred toast is brushed with a puree of fresh basil and good olive oil. Ice cold, creamy, dreamy burrata cheese (have you eaten burrata? 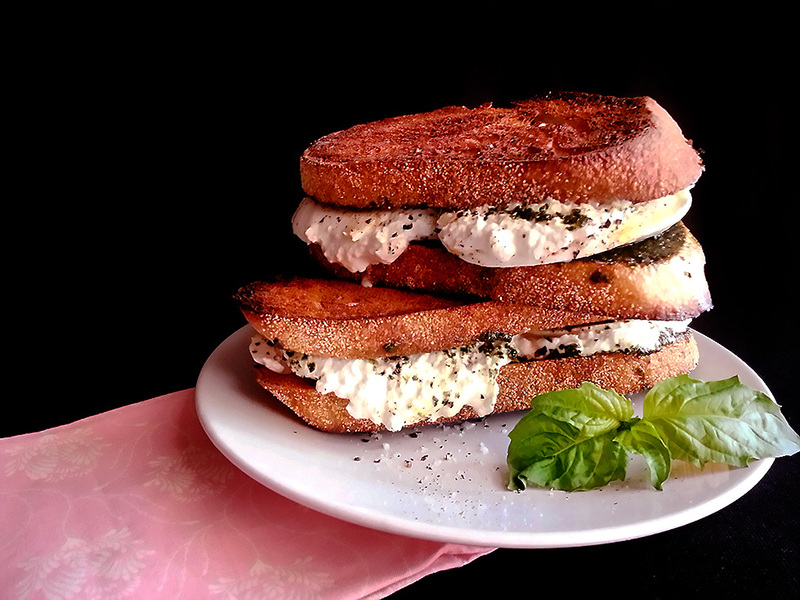 It’s like fresh mozzarella and ricotta cheese had a delicious baby) is sliced in half and sprinkled with fresh black pepper and crunchy sea salt, then smushed between the toast. Let’s add a few fresh leaves of basil to the stack too, just because we can. 2015 is your year, dudes. This is the sandwich to ring it in right. Preheat your oven’s broiler while you assemble everything. Fill a measuring cup with the olive oil, and roughly tear the handful of basil into the oil, saving a few whole leaves to the side. Blend the basil and oil with an immersion blender until very well pureed. Set aside. Place the 4 slices of bread on a sheet pan under the broiler. Let toast until golden brown, keeping an eye on the bread the entire time. Flip the pieces of bread over and toast the second side until dark brown and charred on the edges, also watching it so it doesn’t burn. Remove toast from the oven and brush the lighter sides of the toast with the basil puree. Slice up the burrata and top two slices of toast with 4 ounces of cheese a piece. Sprinkle the cheese with a good dose of black pepper and sea salt, an extra little drizzle of oil if you wish, and a few fresh whole leaves of basil. Top each cheese half with its other piece of toast. Eat immediately to get the delightful contrast between the warm, crunchy bread and ice cold cheese. Congratulations! You’ve just eaten what may be the best sort-of-grilled-cheese sandwich you’ll ever have. With this sandwich, you’ve also now beaten 2015 into submission. Enjoy the rest of your badass year! Previous Previous post: it’s all happening!